Established in 1990, Carson Optical began life in the basement of the founders mother's house in Long Island, where Richard Cameron imported and exported a wide array of products between the US and Japan. As business flourished, it grew out of its basement home and moved into a warehouse in Huntington, New York, where Carson expanded its range of Binoculars and also branched out into related optical devices like Magnifiers and Microscopes. Suceess was mainly down to their focus on innovation, which helped Carson compete effectively with much larger industry competitors and this overall philosophy is still what drives Carson today. Today Carson Optical is a leading supplier of consumer optics and their portfolio includes microscopes, monoscopes, rifle scopes, telescopes, night vision devices, magnifieers, lens cleaning kits, tripods as well as a large range of binoculars. 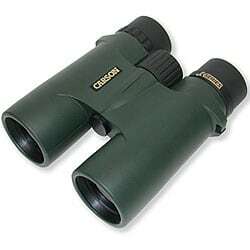 Carson Optical currently offer a wide range of binoculars suitable for most uses including travel, bird watching, wildlife observation, hiking and camping as well as hunting, sporting events. The binoculars are grouped into a "Series" covering a wide range of price points and vary in the quality of their optics, coatings and build quality. Currently their top of the range binoculars are the Carson 3D Series Binoculars. 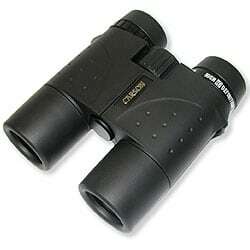 The 3D Series of binoculars contains Carson's flagship range of binoculars with 5 different models,. 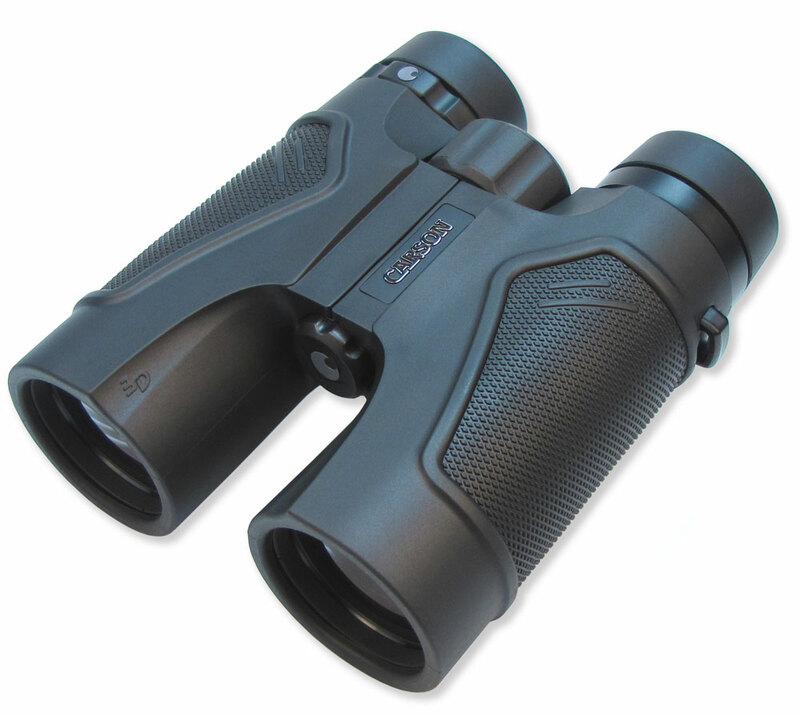 All 3D Series binoculars are of a roof prism design featuring high quality components and optics including fully multi-coated optical elements and Phase corrected BaK-4 prisms that give a sharp and high-contrast image over the full field of view. In addition the 10x42mm TD-042ED model uses ED (extra low-dispersion) glass that further increases optical performance and enhances their light transmission. All the 3D Series binoculars are 100% waterproof and nitrogen purged meaning that the internal air has been replaced with dry nitrogen to ensure there is no internal fogging in areas of high humidity or rapid temperature changes. The binoculars also have a rubberized armor coating over their lightweight body as well as twist-up eye pieces and a adjustable diopter. Carson's XM and XM-HD Series Binoculars also include many high end features and components. these include phase corrected roof prisms. All but one model also have their own "HD optical coating technology" that Carson says significantly enhances the light gathering capabilities of the XM-HD™ Binoculars for an even brighter, sharper images in low-light conditions. The Carson XM Series Binoculars also feature a rubberized armor coating and the body is nitrogen purged and O-ring sealed making them waterproof and fogproof. Most models have plenty of eye relief with twist down eyecups making them ideal for eyeglass wearers. These roof prism binoculars come in 5 different configurations ranging from the large 12x50 VP Series binoculars to a compact 10x25 model. 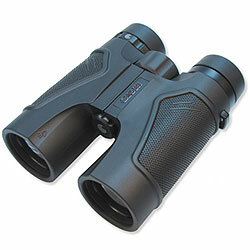 The VP Series binoculars feature BaK-4 prisms and fully multi-coated optics. In addition, the VP-832 8x32mm Binoculars have phase correcion coatings on the prism glass and are waterproof and fog proof. The VP Series binoculars make a great choice for a good value hunting, birding, hiking or fishin binocular. They both feature a roof prism design using quality BaK-4 glass and come with optics that have been fully multi-coated. Their coatings, quality glass help to take and transmit as much of the gathered light as possible to your eyes, which can rally help and is indeed most noticable when lighting conditions are not great or even poor. Other features and highlights of the JK-042 and the JK-842 8x42mm binoculars are that they have been fully sealed to make them waterproof. On top of this, the inside air has been replaced with nitrogen, which will help stop any internal fogging of the lenses. These Carson binoculars use the helecoid twist up eyecups, that includes 3 fixed stopes to give you plenty of options to get the right amount of eye-relef for your needs. As you would expect they also have use a diopter adjuster that which can be used to allow for any differences in your left or right eyes to get the perfect focus for your vision. 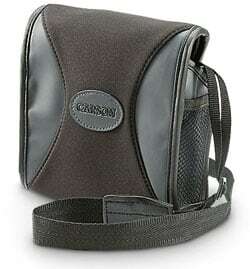 Carson market the JK Series as ideal everyday, birdwatching, hiking, huning or general widlife observation binoculars. Carson make a few simple but very cleverly designed binocular cases known as BinoArmor cases that wrap around your optics unlike traditional Binocular Cases. This ingenious design allows for extremely quick and easy binocular access in the field as you can use your binoculars without having to completely remove them. BinoArmor is also virtually impervious to the elements, they eliminate the need for lens caps and rain guards, they are also almost silent to open and close and they work with standard neck straps or a binocular harness as well.